I’m so excited about sharing this recipe with you. I’m not kidding when I say that these are the best pancakes I’ve ever made and possibly even ever had. What started out as a failed attempt at making waffles, turned into these flippin’ incredible pancakes. They’re foolproof, easy and quick to make, fluffy, taste so good, and still healthy. What more could you want in life? These pancakes are the perfect weekend breakfast or dessert. 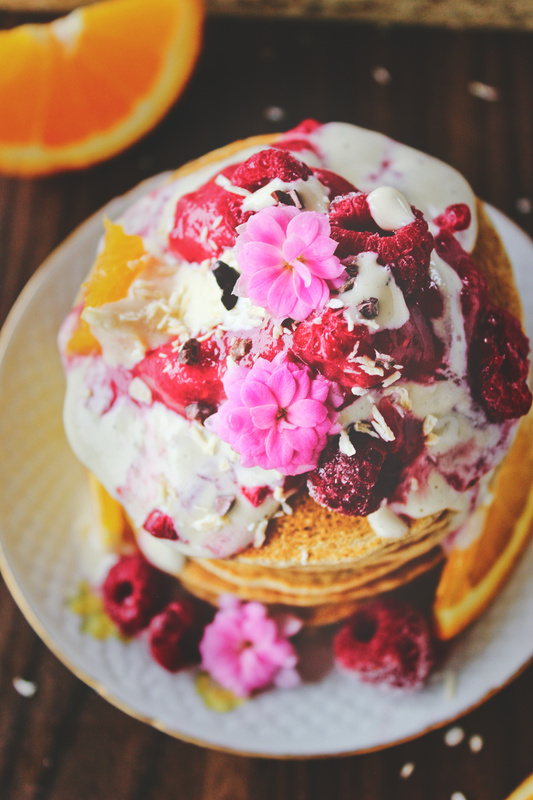 For breakfast, serve them with (n)ice cream and fruits, and for dessert you can indulge and get yourself some non-dairy ice cream! But either way, you can’t make these without making my vanilla sauce, too. 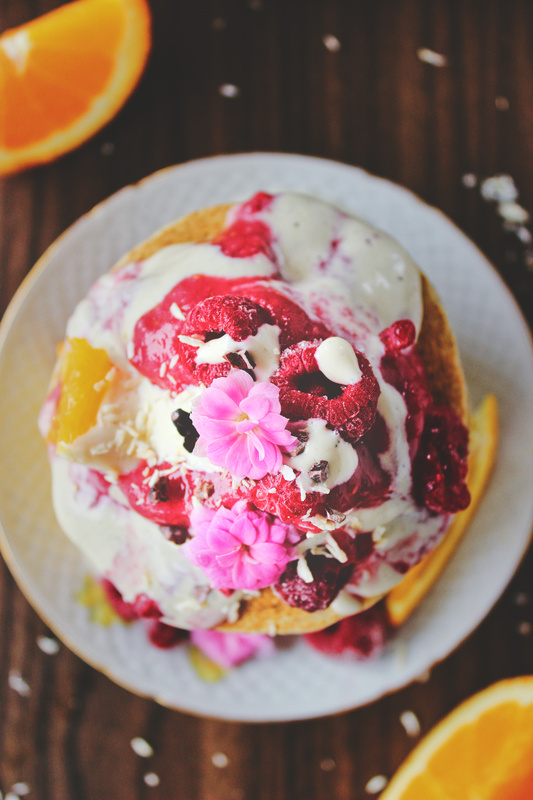 It’s healthy enough to pour all over your breakfast, and delicious enough to serve with your dessert as well. Up until this point in my life, my pancake experience was making what Americans would call “crêpes” on vacations with my dad and then–after going vegan–blender banana oat pancakes which I’m sure most vegan have tried and if not, then at least heard about. But these spelt pancakes truly make me feel like I have mastered the art of making pancakes… I mean, just look at that fluffiness! 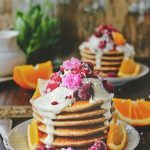 Whole-grain spelt flour: I’ve made several batches of these pancakes, each one using more whole-grain spelt flour than the previous. 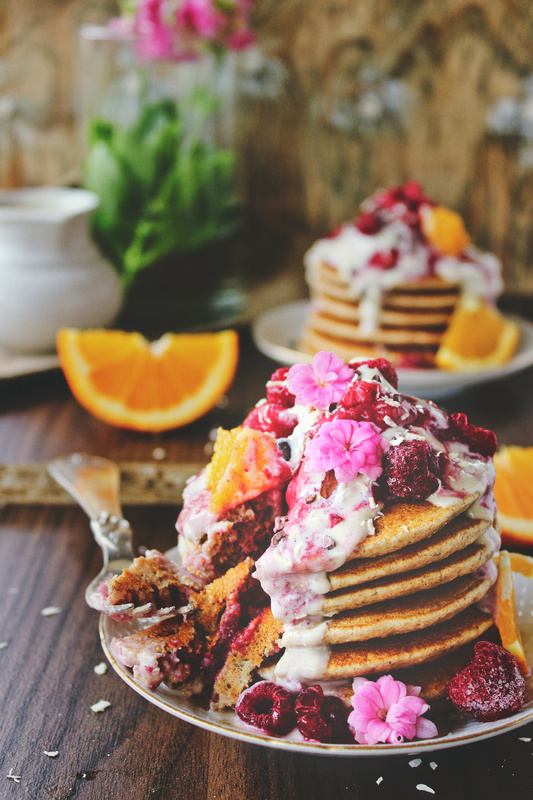 The day I shot these pictures, I made the pancakes with a 100% whole-grain batter. I honestly didn’t notice a difference when using a mix of light and whole-grain spelt flour, so I recommend you just go all the way with the whole grains! Maple syrup: I only use a little maple syrup to sweeten my pancakes, but you could use more depending on how big your sweet tooth is, and how you’d like to serve yours. Any liquid sweetener will do, so feel free to use agave nectar, rice malt syrup, date syrup, et cetera. You could also go the other route and omit the sweetener altogether, of course! Non-dairy milk: I’m pretty sure any milk will work with this recipe, so you can pick whichever one that fits your needs. I really hope you give these pancakes a go for your next breakfast (or, why not, even lunch or dinner–what are labels anyway?) and decide for yourself wether these truly are the best spelt pancakes you have ever had. 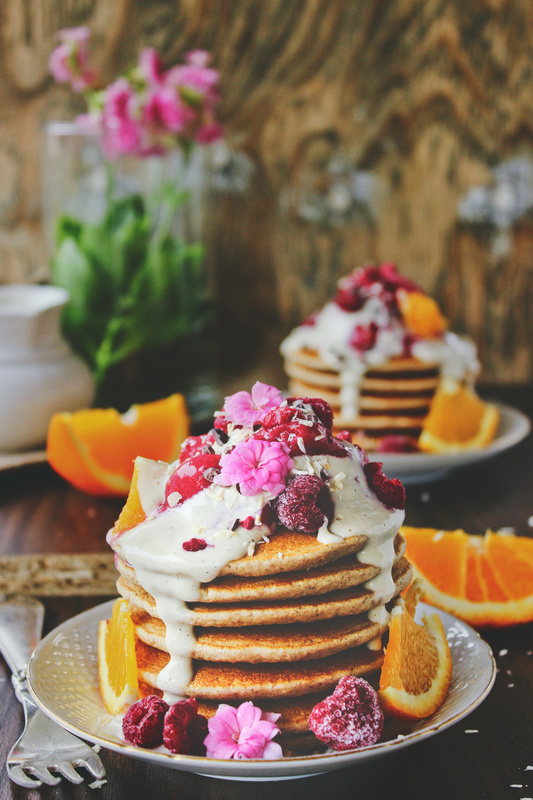 Let me know what you think about them by leaving a comment below and taking a picture of your pancakes, posting them to Instagram, and tagging me: @spirendeveganer. I’d love to hear your thoughts and see your recreations. And you might notice that I’ve updated my blog’s look, and I can’t tell you much more than I just felt like it. I’ll see you next friday where I’ll be sharing the vanilla sauce I poured over these delicious pancakes! In a medium-sized mixing bowl, mix the spelt flour, baking powder, baking soda, and salt well. Add the flax-egg, maple syrup, apple cider vinegar, and non-dairy milk and mix until you have a smooth batter. It should pretty thin. Warm a non-stick pan to medium heat for a couple of minutes before you start cooking your pancakes. Pour the batter on the warm pan with a large spoon. Don't smooth it out, it should be thin enough to spread on its own. Let the pancake cook on the first side for 2-3 minutes until the edges seem dry and air bubbles have formed before flipping it and cooking it on the other side for another minute. Once cooked, transfer the pancake to a wire rack or plate to rest. Repeat until you have used all your batter. 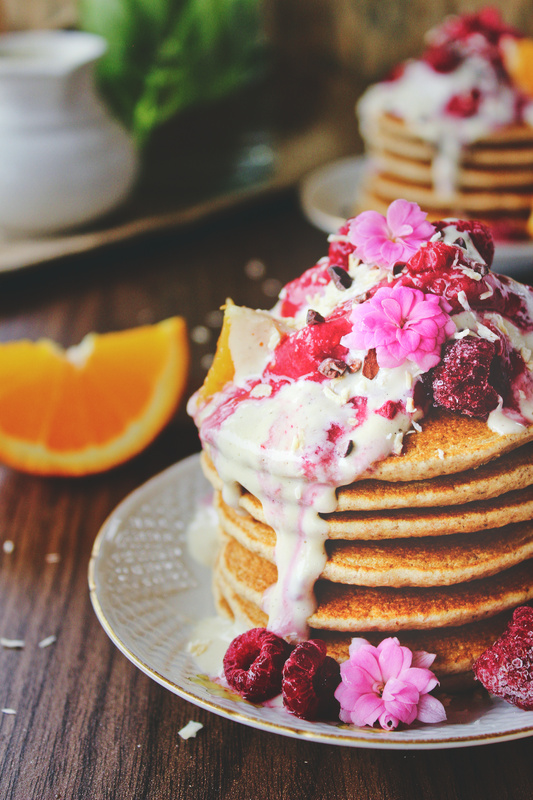 Stack your pancakes on a plate and serve them with, for example, (n)ice cream, vanilla sauce, and fruits. 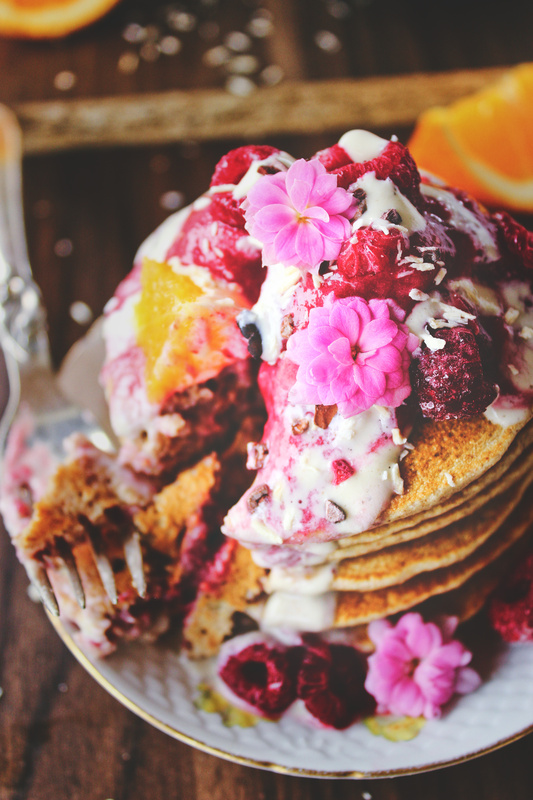 Store leftover pancakes in the fridge for 2-3 days, although they are best when eaten immediately. 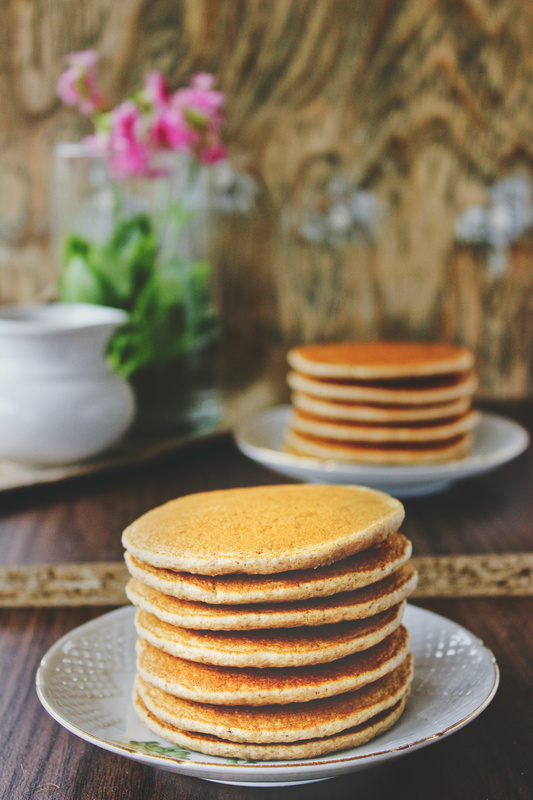 I haven't tried freezing them, but here's a guide on how to freeze and reheat pancakes. To make a flax egg, combine 1 tbsp ground flax seeds and 3 tbsp water in a small bowl and let it sit for 5 minutes to set.